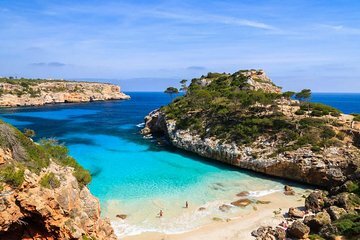 Explore the legends and beauty of Mallorca’s rugged southeastern coastline on this 1-hour boat tour departing from Cala Figuera. Cruise past sea caves once used as smugglers’ hideouts, and see the interesting rock formation of Es Pontás. Splash into the clear waters to swim or snorkel near the picturesque beach of Caló d'es Moro, and learn about the island’s past as you glide by the historic fishing shacks of S’Almunia. Group size is limited to 12 for a more personalized experience.